Graphical representation of the findings described in the paper. Spred1 maintains hematopoietic homeostasis by controlling both of HSC self-renewal supported by ROCK activity and tumor suppression due to inactivation of ERK signaling. 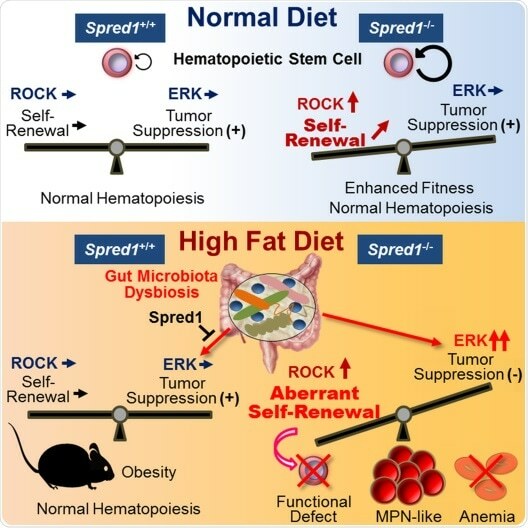 Spred1 deficiency under high-fat diet condition induces the activation of ERK signaling, resulting in functional HSC failure, severe anemia, and development of leukemia. The hematopoietic abnormalities are mediated by the gut microbiota dysbiosis.